Designed by Christian White, a Haida from the Queen Charlotte Islands (Haida GB126waii), this piece is inspired by Haida stories. 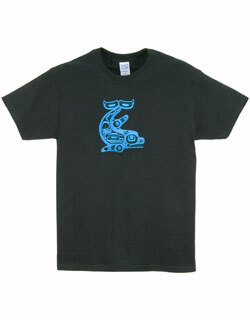 "Each time," says Christian, "I hear a Haida story again I'm inspired by a new part that I've never understood before. There's a constant renewal of ideas for me." The original, carved in argillite, is part of the Canadian Museum of Civilization Collection. The size of this keychain is 2 inches long by 1 inch wide and ¾ inch thick. Natural resin composite. The color is Black. Made in Canada. The reproductions are made by Boma, a Canadian company producing a range of collectibles and giftware. Christian White was born in 1962 in Queen Charlotte City, Haida Gwaii (Queen Charlotte Islands, British Columbia) and grew up in Old Masset. He is from the Dadens Yahgulaanas Raven Clan and his Haida name is "Kilthguulans" (Voice of Gold). Carving since the age of 14, he has become well known for his work in argellite. Christian belongs to an extended family of practicing artists and cultural preservers, being taught by his father, Morris White and studying the works of his great-great grandfather, Charles Edenshaw.